Seoul and Pyongyang on Friday installed and successfully tested a telephone hotline between ROK President Moon Jae-in and DPRK leader Kim Jong Un, the South Korean presidential office announced. Youn Kun-young, director for government situation room at the Blue House, told media that the hotline was tested at 1541 KST and that two officials from both sides made a phone call for 4 minutes and 19 seconds. The hotline is reportedly installed at the desk of Moon Jae-in’s oval office and is connected to North Korea’s State Affairs Commission. The timing of a planned phone call between the two leaders – slated to take place ahead of their meeting next Friday – is yet to be decided. The two Koreas agreed to establish a hotline between Kim and Moon during a two-day visit by South Korean special envoys to Pyongyang early last month. To facilitate the setting up of the hotline, working-level talks on communications matters were held twice on April 7 and 14 at Tongilgak, the northern side of Panmunjom. 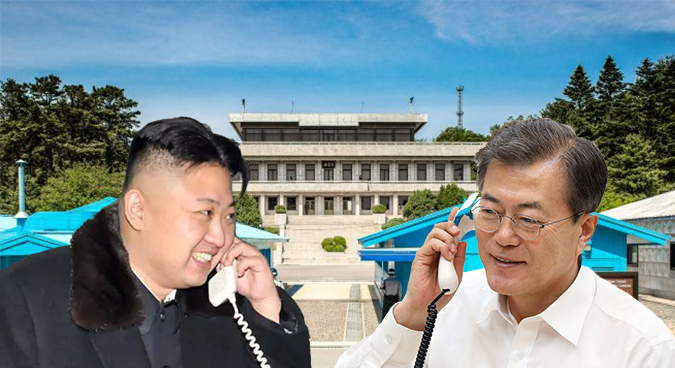 The South Korean Ministry of Unification (MOU) in March told media that this would be the first case of a hotline being established between the DPRK and the ROK leaders. Some, however, have claimed a more clandestine line existed under previous administrations. Lim Dong-won, who served as unification minister and spy agency director under the late Kim Dae-jung, has said there was a hotline between the then-ROK President and the later DPRK leader Kim Jong Il in the early 2000s. The hotline, however, was installed and operated by the intelligence agencies and the two leaders did not use it for one-on-one conversations. The communications channel is believed to have been disconnected under the Lee Myung-bak administration. In his book “Peacemaker: Twenty Years of Inter-Korean Relations and the North Korean Nuclear Issue,” Lim said Kim Dae-jung had proposed establishing the hotline at the first inter-Korean summit in 2000. “…Let’s communicate directly between the two leaders if something significant happens. How about establishing an emergency communication network between the two leaders on this occasion?” Kim Dae-jung was quoted as having said in the book. “I think that is a great idea. Let’s do it,” Kim Jong Il reportedly responded. In his book, Lim said the hotline “played a very significant role in solving inter-Korean issues,” and described it as “one of the greatest achievements” of the summit. A South Korean official — who wished to remain anonymous — told media earlier on Friday that the timing of the hotline installation was linked to ongoing events in the North. “We will see when hotline is installed and test call is made in line with an event of the Workers’ Party of Korea,” they said. While the official did not specify which event they were referring to, Friday did see the convening of the Third Plenary Meeting of the Seventh Central Committee of the Workers’ Party of Korea (WPK). The meeting was being held to “discuss and decide the policy issues of new stage in line with the demand of the important historic period of the developing Korean revolution,” the state-run Korean Central News Agency (KCNA) reported on Thursday. The North severed communication channels with the South in February 2016, in response to the Park Geun-hye administration’s decision to suspend operations at the Kaesong Industrial Complex (KIC). But January saw Kim Jong Un order the re-opening of an inter-Korean hotline at the truce village of Panmunjom to facilitate discussions on the dispatch of a North Korean delegation to the PyeongChang Winter Olympics. Pyongyang also has restored a military communications channel on the western coast, notifying Seoul of the move at high-level inter-Korean talks on January 9.